Today we made great ocean road from Melbourne to Warnambool. We started from our hotel 7 am and finished the journey 8 pm. On 13 hours from Melbourne you manage to travel the most famous road in Australia in a moderate pace without stress. On the way we stopped at tree beaches and probably ten lookouts. The most interesting part was between Apollo Bay and Warrambool. 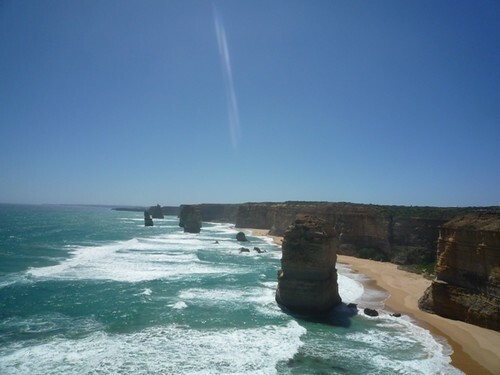 This is where the sand stone makes a very beautiful coastline with the Twelve Apostles as the most famous attraction. This is sand stone cliffs that have been cut off in the ocean. Fantastic beaches stretch below the mountain range of the sand stone cliffs. 07 Jan This entry was written by David Gustafsson, posted on 01/07/2010 at 21:09, filed under Traveling and tagged australia, Great Ocean road, Melbourne, Traveling. Bookmark the permalink. Follow any comments here with the RSS feed for this post. Both comments and trackbacks are currently closed. Older: South coast Australia pictures!